If you are looking for a very special rocking horse for a baby or toddler, you need look no further Europe's favourite rocking horse. This superb little horse wins awards, praise and friends wherever it goes. We don't know of a world championship for rocking horses, but this little rocking horse was voted Europe's favourite rocking horse and was also featured on a primetime Japanese TV programme which showcases the best of European design. Many children in the USA have also fallen in love with Europe's favourite rocking horse. A determined project to create a rocking horse of heirloom quality at an affordable price gave birth to a stunning little rocking horse, based on a Haflinger horse, crafted from solid beech, and then sanded and waxed to a smooth and safe finish. 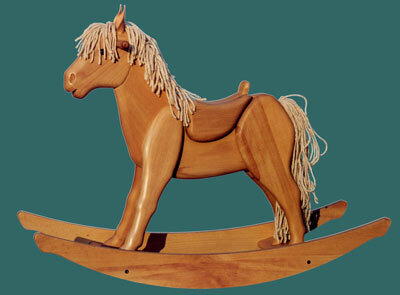 Europe's favourite rocking horse measures just over 1 meter (40") long. 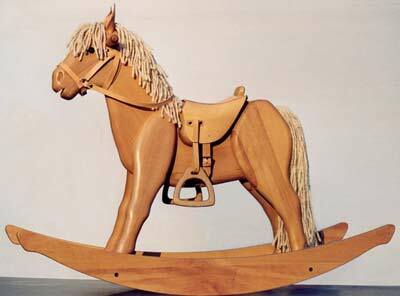 With a saddle height of 50cm (19"), this is the optimum size of rocking horse for the younger child. The mane and tail are made from pure new wool and the ears are genuine leather. To add to the fun, the range of optional extras includes a leather saddle and bridle, a blanket, a grooming brush and a rosette. Note: For added safety and an extra boost for the energetic young rider, the rocking horse does include a footrest which is not shown in the photographs. The rocking horse costs only £299 (plus P&P if ordering by post). The saddle and bridle cost £50 together. The lovely little rocking horse blanket, rosette and grooming brush cost £20. welcome@rockinghorserevival.com to receive a quotation. "We're delighted! Thanks very much indeed. She/he/it is certainly gorgeous!" "Kelly adores her rocking horse and just can not stop smiling at him! Thank you very much indeed for the friendly and efficient service." "She is gorgeous (she's definitely a girl!) I can't believe how lovely she is!! Baby hasn't arrived yet, so she (the rocking horse) is still in my house hiding!!"